One doesn't drive the Merritt Parkway, a pulsing arterial byway linking the New York suburbs to Connecticut's Housatonic River basin; one courses through it. Beneath a great canopy of sun-shielding oaks, you vault upward to near-weightlessness and then dive down into sweeping, neutral-camber bends, urged on by gravity and luscious waves of machine torque. In the right car, on the right day, it's like a spirit ride through the Enchanted Forest on a magic mushroom. Some locals call it the commüterring. The 37-mile four-laner opened to traffic not long after Ford introduced its flathead V8, the engine that brought the addictive, stomach-tickling shove of high torque — or rotational force — to the masses. Applied to the rolling hills of the Merritt Parkway through a modern 1930s chassis, the Ford V8's thrilling, butter-smooth acceleration probably did more to advance the flight to the suburbs in pre-WWII America than backyard hammocks and cheap government loans combined. Indeed, the Merritt is best enjoyed in single, torque-laden bites, without the gearbox kicking down like a nagging in-law, and a firm-but-compliant chassis in a neutral-weighted car with plenty of grip. 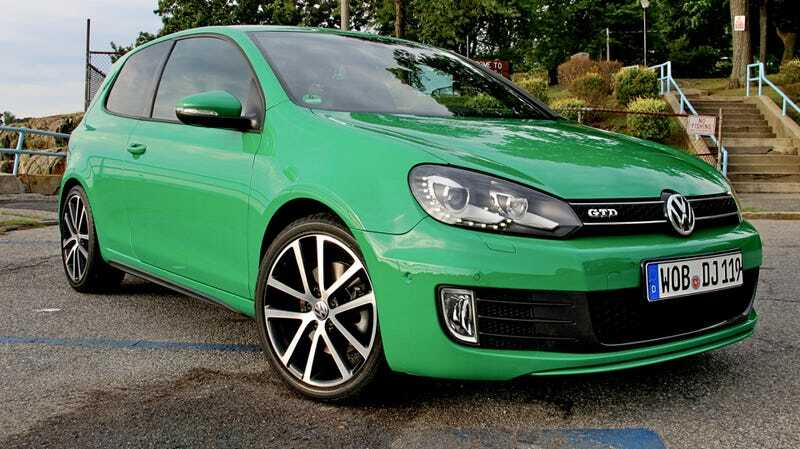 A car, for example, like the Volkswagen GTD. Our rallye green (or thereabouts) tester isn't a U.S. product — VW's been taking an ongoing parade lap with some of its overseas models. Your response to this and other accounts of driving it may play a role in VW's decision to bring over the GTD or leave it for the Europeans. Either way, let's be clear. The GTD is not a GTI with a diesel engine, as some may have hoped. As driving experiences go, the GTD lacks the revvy, sports-car sparkle of its GTI cousin in close-quarters combat. It has more in common with VW's erstwhile R32. In fact, the GTD's 2.0-liter, common-rail turbodiesel inline-four has a higher torque peak than the R32's VR6 had —- 258 vs. 236 lb-ft. The VR6 had longer legs, though; the TDI breaks camp at 4500 rpm, and the lag between pedal-down and action in the GTD can feel like a yawning chasm when trying to blast out of a low-speed corner. Swooping into the Merritt's high-speed, wide-angle curves at 70-80 mph, the GTD feels undertaxed and planted, aided by adaptive dampers — optional, and not for U.S. export — set to sport mode. The DSG trans box keeps the gruff-sounding TDI in a narrow but sublime rev range, placing big dollops of thrust right there for the scooping. (There's a six-speed manual available too, but I'd rather let the DSG's algorithms skirt the blink-and-you'll-miss-it redline.) The steering is familiar — light, direct and accurate. The brakes have good, bracing bite like hot coffee on the tongue. But it's the diesel's torque delivery that's the drug, and I just keep feeding the habit. BMW's said to be planning a two-liter turbocharged diesel four that will soon challenge the VW TDI, and a new, more powerful three-liter turbodiesel six is reportedly on the way as well. When it comes to convincing Americans to buy diesels, the con argument has always been that we've been poisoned by lame attempts — like GM's cynical dieselification of its small-block V8 more than 30 years ago. But the more up-to-date issue is cost. Not just the extra cost of a gallon of diesel, but also many U.S. states' stricter standards (than Europe's) in limiting nitrogen oxides (NOx) emissions. Diesels produce more of the acid-rain-and-smog-causing stuff, and carmakers like VW and BMW must engineer pricey cleansing procedures to be 50-state compliant. The NOx issue is more pronounced with larger cars, like the BMW 335d and Passat TDI, which use a purpose-built catalyst and urea-injection system, reducing NOx emissions by around 95 percent. Smaller cars, like the U.S. Golf TDI and Jetta TDI get by with a less costly NOx exhaust gas recirculation system and it's assumed (though not confirmed) that the GTD would too, if it ever came here. Despite the hurdles, diesels have already won over some Americans hip to their superior fuel economy, and who also get what Europeans have understood for years: Big midrange torque plus German luxury plus long stretches of highway equals pleasant motoring. But here's my pitch to Volkswagen — Americans may be surprised at how much fun a smaller, sportier car with a diesel's smooth midrange torque can be on a winding, high-speed rollercoaster like the Merritt. This sort of daily, exurban hoonage is both more mature and nearly as exhilarating as hammering a GTI through a tighter-wound, serpentine b-road. We may just need some convincing. Sure, it's a narrow sell. But hey automaking isn't for risk-averse marketers who shrink from a challenge. Wink. During commuting hours, the Merritt sees 80,000 cars in a day. But on a weekday in late morning, there's just enough traffic to telegraph distant-early warning signs of impending speed traps, but not so much to squelch the GTD from chugging along in the four-to-six license points range — average mileage, 36.1 mpg. This is the GTD's party. Maybe one day we'll be invited to it. It's one way to halt the progress of the Beigekrieg.